One of my clients called me a few nights ago, and was having problems getting and staying on the Internet. After talking to him for a few minutes, I was able to determine that the computer system had been hijacked by a new variant of the program called PC Guardian. I loaded up fresh USB stick with Simply Super Software’s Trojan Remover, and off I went to his house to “fix” the computer. Unfortunately, this was the same computer I fixed a few months ago using Trojan Remover when another rogueware program hijacked it. This computer has a current copy of GFI’s Vipre on it, but the virus definitions hadn’t been updated in over a month. (This gentleman is rarely home, and does not leave his computer on all the time). When I realized that SSS’s Trojan Remover was not going to work, (it wanted me to buy the software), I unplugged the desktop unit, and took it back to my house. Once there, I removed his SATA hard drive, loaded it into a SATA external HD case that I have, fired up my desktop, and did a full scan of his drive using Vipre. It quarantined the Trojan-Downloader.Win32,Fraudload virus, but did not get rid of all the underlying files. I have been wanting to do a “wipe and reload” on this computer for over a year now, but the owner hasn’t agreed to it, yet. By this time it was getting late, and I decided to get a fresh start on the problem in the morning. The next day, after bouncing a few ideas off my buddy Ernie Hatfield, (who owns Heart of the Rockies Internet Solutions in Salida, Colorado), I decided to give the ComboFix tool a try. (NOTE: only use this link to download ComboFix, as this is a trusted source. There are some bogus versions of ComboFix out there on the Internet). ComboFix is a great tool, but should only be used by a someone who understands the consequences of Murphy’s Law. (There have been problems when using this tool on Windows Vista OS based computers. This particular computer is still running Windows XP). After reading the instructions, I loaded the ComboFix tool onto the infected desktop computer, and ran the program. It took quite a long time, (being very thorough), to inspect all the files and remove the infected ones. Once the computer rebooted, (which it did sucessfully), everything was fine, the PC Guardian icon was gone from the tray, and the computer had no problems getting, (and staying), on the Internet. I returned the desktop computer to the gentleman, with a stern warning about updating Virus protection first, before doing anything else. In the early 1990’s, I was Sales Manager for the largest computer builder and repair shop in Albuquerque, New Mexico. We sold a lot of custom built computers every month, and our clients included Sandia Labs, Los Alamos Labs, Albuquerque Public School System, and thousands of professionals. We did very little advertising, we had no big yellow pages ads, mainly just a small ad every Monday in the Albuquerque Journal’s business section. We also had a large client base of personal users, usually obtained by referrals from our business clients. We even gave classes to new computer users on Tuesday and Thursday nights at our training center classroom, right in the store. I personally sold a lot of computers every month, with most of my sales coming through the front door. There were a lot of options that we had to cover when someone would order a new computer system. Case style and size, processor type and speed, amount of RAM, hard drive number and size, operating system, how many floppy drives, (yes, floppies), perhaps a CD reader, monitor size and brand, mouse style, and selection of keyboard, as we carried about 10 different types of keyboards. I had sold a new system to a retired couple, and they were taking advantage of our “newbie” classes. They had taken our “introduction to computers” class together, and he seemed really interested in learning about installing software. I was working the late shift one night, (we were open until 9PM, M-Sat), when in he came, madder than a wet hen. He told me, (in a raised voice), that I had sold him a “defective” keyboard. I said “no problem, let’s go pick out another one“, and we moved over to the keyboard section of the store. He looked over all the keyboards, and exclaimed, “but all of these are also defective“. When I asked what he meant by defective, he explained that he was installing a new piece of software on his computer, and when it finished, the message on the monitor said “Hit any key to continue….“. He had looked all over the keyboard and could not find the “any” key. When I explained to him what the message actually meant, we both had a good laugh. I made sure that our class instructors added a section about the “any” key to our curriculum. This experience taught me a lot about how you talk to new users. I learned that no matter who you were talking to, always start at bottom, in the simplest of language without being condescending, because you can always ratchet up the “geek level” if need be. 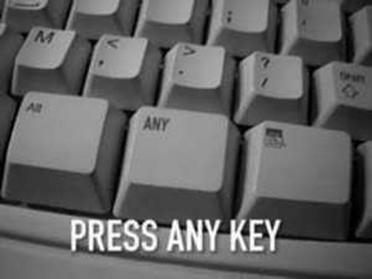 Years later, I saw that an enterprising entrepreneur had developed a raised “any” key that you could stick on your keyboard. I cannot stress enough how important it is to have a great Rheumatologist. Dr. Nancy Scheinost is the fourth Rheumatologist I have gone to, and she has done the most to curtail my level of pain and improve the quality of my life. I wish I had found Dr. Scheinost sooner, as I might have been able to avoid the crippling deformities to my hands and feet. Dr. Nancy takes a whole body approach to treatment, such as a blood test that showed I was very low for vitamin D. ( No other doctor has ever checked my vitamin D level.) Since I started taking the vitamin D supplement, my health in general has improved, I have more energy, and even had improvement on my osteoporosis bone density test. Dr. Scheinosts’ office is located in Bryan TX about 150 miles away. It’s a long drive, but the regular schedule is once every three months. It is more than worth the drive, (6 hours round trip), to have a caring, progressive person taking care of me. Rheumatologists are scarce to begin with but that doesn’t mean you should settle for someone who you don’t have complete confidence in. RA is a lifelong disease with many ups and downs, so you really need someone who you feel completely comfortable with.